Is Socialist Revolution Possible – Or Even Necessary? I look at the world for many decades now and do not see evidence that the class struggle is alive and well, except to the extent that workers are on the losing end. But even more than that, it does not appear that the class struggle is playing a key role anywhere in the world. All of the major conflicts are being fought on national, ethnic and/or religious grounds. In these conflicts, whether they are in Syria, Afghanistan, Yemen, Niger or even Catalonia, workers line up with their tribe. It used to be that the anti-colonial forces at least wrapped themselves in the mantle of socialism, as in the days of the Algerian, Vietnamese or Angolan struggles for independence. Now it is ISIS and kindred groups of fanatics who are pretending to lead the charge against Western imperialism or neo-colonialism. It looks to me that every attempt to achieve socialism has gone bad. Compare the former East Germany with former West Germany or the current North Korea with the current South Korea. Do the people of China yearn for the “good old days” of Mao Zedong or are they infinitely more prosperous under state capitalism? I was in Poland a few years ago. No one had a good thing to say about the “People’s Republic.” The most recent socialist experiment in Venezuela is going down the tubes. It was been nearly 170 years since the Communist Manifesto and 100 years since the Bolshevik Revolution, where the workers held power for at most two or three years. The left in Russian has been insignificant since the fall of the collapse of the Soviet Union over twenty five years ago. What happened to the once mighty Communist parties of Italy and France? Obviously their demise did not lead to the rise of the rise of the anti-Stalinist left. I recently met a Socialist Party USA activist at a Labor Day Parade in New Jersey. When I mentioned that Bernie Sanders working within the Democratic Party was the best alternative, he opined that Sanders is not a socialist. Well, I said, you are right. Generically he is a social democrat. But if he went around calling for workers’ ownership of the means of production, he would have never even been elected the mayor of Burlington, VT. Even Eugene Debs could never garner more than 6% of the popular vote, nor could the original Socialist Party in its heyday elect more than two Congressmen. Here is my question. If revolutionary socialists have nothing to show for all their efforts for the past 180 years, maybe it is time to give up the ghost and accept that social democracy on the Western European or Scandinavian model is the best we can achieve. 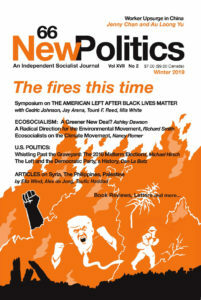 Yours is a fair question to ask of editors of an eclectic left journal, though one largely committed to the radical vision of socialism from below: why the unblemished optimism over the prospects for radical social change in the face of hideously disappointing, centuries’ long results? Here’s my attempt at clearing the air. Understand that you’re asking two questions that aren’t necessarily conjoined. First, why have the expectations of revolutionary socialists going back to Marx and Engels that a growing proletariat would act of necessity to overthrow capitalism in its own interest been so dismally unfulfilled. And second, given that, why do we not simply embrace a social democratic coda stressing reforms, or, as Trotsky put it in September 1939 in a moment of despair, resign ourselves to fight to improve the conditions of the slaves. As to the first, you have to take seriously the economics that came out of World War II. Socialists from Michael Harrington to Daniel Singer cite the ascendance of Keynesian economics, which created a welfare regime in which consumerism didn’t empower working people so much as substantially increase their purchasing power – as a spur to increasing production – during what the French called Les Trente Glorieuses (the thirty glorious years, i.e., 1945 to 1975). What followed, what I call the thirty inglorious years, is still working its way into people’s consciousness as a new and growing subclass of contingent workers – the precariat –typifies the life chances of millions of young people worldwide, while the traditional industrial proletariat – still numerous in absolute numbers though shrinking in proportion to other sectors – is joined by public sector workers battling to defend what is left of the social safety net. In short, the class struggle is still being waged, and with a newly reconfigured working class, though capital holds the high ground. Unions are at least organizing the unorganized in sectors that barely existed a generation ago. That’s one example of class struggle as fought by our side. I think you will agree it is promising. On social democracy. You have to take seriously its sad history, along with the early degeneration of its main left critics, the Communists. In the United States, what was left of any New Deal politics died with the oil embargo of the mid-1970s and the rise of the New Democrats, who were neither new nor barely Democrats. Increasingly, US liberals and European social democrats in office were administrators of the state and enablers of the capitalist system, not its gravediggers. In France, François Mitterand prior to his 1981 presidential breakthrough made a series of bold promises to nationalize industries, some even under autogestion, a broadly understood French version of workers’ self-management. Within days of his inauguration, all mention of autogestion was gone. Within two years, industries nationalized were reprivatized and Mitterand served out his term as a caretaker for capital. Do I exaggerate? In Sweden, the Meidner Plan, a real reform that, if implemented, would have nationalized industry under a form of workers’ control, saw the Social Democratic Party abandoning it after Swedish capital moved against them. The Soviet-backed CPs for the most part went from slavish support for all things Stalinist to a warmed-over reformist Eurocommunism without blinking, seeing their vote in Italy reduced from 30 percent to utterly marginal. Those that stayed Stalinist, as in Greece and Spain, shriveled on the vine. What does all this mean? Capital had a plan and the means to follow it through, whether in good times then or in periodic crises now. The left, as embodied by the social democrats and the then extant Stalinists, did not, have a plan beyond posing as governing arbiters if not mediators. Class struggle was relatively muted – or at least less obvious – in the boom years; it is raging today in what the 1970s United Auto Workers president Douglas Fraser presciently called “a one-sided class war.” The left, not to mention the unions as a whole, bears some responsibility too. If Antonio Gramsci is to be taken seriously, we’ve collectively done a languid job of getting our ideas out. As society becomes more socialized, and where social reproduction is now better understood by the left as a corollary to economic exploitation at the point of production, socialism as the logical outcome of a post-industrial socialization ironically takes the form of automation instead of workers control. The alternatives desperate people grasp, such as the noxious nationalism and racial or religio-posturing of a Trump and a Netanyahu, just to name two with whom you are doubtlessly well-familiar, seem to attract supporters by default. What I’ve written here is hardly exhaustive, but I expect it addresses your concerns. The class struggle is ongoing, economic crisis is endemic, the long-range choices are still as Karl Kautsky and Rosa Luxemburg argued, a choice between socialism and barbarism, with barbarism understood as genocidal total warfare and/or environmental liquidation. Trotsky’s conclusion, even in his darkest days, that there was no “incontrovertible or even impressive objective data as would compel us today to renounce the prospect of the socialist revolution” (The USSR in War), rings true. Like Pascal’s Wager, what choice do we really have? Resistance to the system is ongoing, even when it takes bizarre and unaccustomed forms as with the Antifa opposition to the rise of white nationalism or the efforts to tear down the statues of undeserving Civil War generals. Defining whose history is true, which for Gramsci was a necessary adjunct of activist, revolutionary cultural work, is part of the class struggle, too. So are the efforts to rediscover commonalities despite seeming differences. The growing acceptance of intersectionality, not as rhetoric but as an activist, working principle, is proving that class and identity are not at variance, but indissolubly entwined. So, comrade Muraskin, a Luta Continua. Fifty years ago, it was the US, with its underdeveloped welfare state, that was out of step with advanced capitalist societies. Neoliberalism, with the complicity of Democrats as well as Republicans, has, in the intervening decades, decimated the labor movement and begun the piecemeal dismantling of New Deal and Great Society gains. This well-recognized dynamic has been replicated on an international scale. Today it is an open question whether the Scandinavian model can be replicated, expanded, or even defended without a worldwide revival of labor militancy. Every civilizational upgrade under capitalism with respect to wages, hours and workplace conditions in the “past 180 years” has been inextricably linked to organized working classes asserting their power over the public domain. The exploited classes defend their interests by seeking to inject the principal of social responsibility against the prevailing, seemingly inviolable, rights of private property. It is a perpetual war for position. Where the working classes have been defeated so too has the cause of democracy and progress been set back. The Scandinavian model is now an isolated outpost in the class war. It is the forward operating base of labor, now besieged from all quarters and in full retreat. If capitalism were a static system, the permanency of class compromise along Scandinavian lines might be an arguable proposition. Labor crusades, above all, for a share of the prosperity its work creates sufficient to permit it economic security, workplace dignity, limitations on social inequality, and a comfortable retirement. Even the most conservative labor leaders contest almost every right of the employer: over hiring and firing; over wages and hours; over the speed and intensity of work; over promotions and transfers. They challenge every right, that is, save one – the “right” to own and manage. This trade union limitation has been replicated on a broader social scale in the scope and limitations of the modern welfare state, a grand compromise between the aspirations of labor for social control and the entrenched requirements of capital for the “freedom” to pursue profit-making. On paper at least, the capitalist state is fully capable of exercising the type of social control over the market place – of managing the truncated “economic democracy” needed to minimize the gulf that separates the public from the private domain that labor demands while ensuring, in modified form, the rights of property. It is long well known, after all, how targeted state spending and taxation can regulate output, employment and income to dampen the effects of the business cycle, while ensuring long-run price stability. It would seem – again on paper – that the welfare state should be a win-win for both classes in society. As long as labor’s circumscribed demands could be satisfied, it had no reason to challenge this compromise. And it didn’t. But what about capital? It, too, would seem to have benefited greatly from this compromise. State spending socializes the costs of training, research, and development and subsidizes the investments that allow individual businesses to commercialize the process of innovation. Infrastructure spending reduces turnover times and assists capital to economize on its costs. State contracts increase the level of capacity utilization and thereby enhance the mass of profits available for investment and capitalist compensation. The welfare state, it would seem, broadly encourages, by dint both of its secular and counter-cyclical activities, a socially favorable investment climate. But if we delve a bit further, we can see that the welfare state has a fatal design flaw that has proven all-but disastrous to this rosy scenario. Full employment and working class economic security eliminates the key threat that management holds over the heads of workers. Without it labor discipline breaks down. And not just labor disciple. Tight labor markets endanger profit margins and intensify the always-latent problems that beset capital accumulation. Moreover, state spending on vast social programs of remediation, as envisioned by consistent welfare state advocates, also transfers capacity from the private domain that would otherwise be available for capital accumulation and profit expansion. Under “normal” circumstances this contagion may be accommodated. We might, with little fear of contradiction, periodize the life expectancy of the welfare state with the relatively exceptional and exceptionally brief period of unimpeded capitalist expansion pursuant to the end of World War II. But what is obscured is this. Productivity under capitalism has to be measured against the effects that the forces of production have on the relations of production; that is, against the production of value and profit. Because capitalist accumulation cannot be separated from labor-displacing innovation, a growing mass of capital investment perpetually seeks profit indemnification against a relatively diminished base of workers directly and indirectly engaged in the production of commodities, the very source of the system’s profits. As long as this fall in the rate of profit can be counterbalanced by a growing mass of profits, the crisis tendencies of capitalism can be averted. But this is also where welfare state expansion comes into conflict with capital accumulation. Rising real wages and the diversion of production from capital formation to individual and state (public) consumption suppress the accumulation process just when its pace needs to be accelerated. Profits are destroyed rather than contributing to capital formation, because they are diverted from the feedback loop of private production. Of course, once the crisis fully sets in, the expansion of state spending certainly has the positive effect of mopping up excess capacity that plagues the contraction of sales and markets. State spending can in theory put the growing legion of unemployed to work and assure that social consumption does not decline. But this increase in economic activity, while socially desirable, is capitalistically useless. This non-capitalist stimulus to demand does not increase investment and profitability. Rather it raises the level of economic activity by bringing excess capacity back into play for the purpose of creating public goods instead of capitalist commodities. What good, then, is the unchallenged “right to own and manage,” if it is exercised under circumstances that imperil the incentive to invest and, which, if left unchecked, all but invites the state to assume responsibility over an increasingly dysfunctional and unresponsive private sector? Where, of course, the system is being actively challenged from below concessions in the form of countercyclical activities is the lesser evil for capitalists. But the restoration of profitability rests not on state spending, but in speed-ups, rationalization and concentration; the elimination of excess capital and an increase in the degree to which profits can be wrung out of the hides of workers. And having spent decades dismantling and neutering all the organs of working class resistance – unions and parties, there is no reason why an emboldened capital should feel the need to concede power and authority for purposes that do not serve its ends. Most socialists share with social democrats the view that a thriving and expanding welfare state is more socially desirable than unfettered capitalism. The difference, however, lies in this. Socialists deny, for the reasons stated, that a healthy and vibrant welfare state is a long-term viable option for capitalists. Welcome as it may be to workers and to the broad public, it rests on exceptional historical and economic circumstances that are unlikely to be replicated. Capitalism cannot be housebroken, and will not share authority. It will violate the class consensus – the implied social contract – that underlies the welfare state and actively prepares to do so as as soon as such opportunities permit. Socialists warn that the welfare state is a privilege extracted from the dominant economic ruling class to be infringed upon and abrogated whenever capitalism finds itself in difficulty or endangered by its continuance. The scandal of the Great Recession is not the failure of the markets to rationally direct investment. Only true believers continue to think otherwise. No, the scandal is the fact that the capitalist state has within its means, by dint of its ability to freely finance any expenditure consistent with existing productive capacity, to offer jobs on demand at a living wage, to assure health care for all, adequate housing, fully-funded child care and a national pension and yet universally chooses not to do so and to step away from well-established arrangements. There are no financial constraints, the “debt burden” fraud notwithstanding, only a political restraint, the restraint that the power of money casts over democracy. That is why socialists raise the demand of expropriation. Not because the tools are not technically available for the state to plan and control the economy, including one nominally under private ownership. One need only look to capitalism under war-time conditions to understand this. No, we call for expropriation because social authority cannot be shared between classes. We call for the nationalization of the banks, for instance, not because public expenditure requires access to private bank capital. The Treasury and Federal Reserve can generate and handle any expense public authority calls upon them to manage. We recognize, in our call, that the socialization of the banks is the only means adequate to put an end to the financial engineering that directs wealth unproductively and exacerbates social inequality. We raise the demand for socialization to end the anti-social behavior of tiny minority in society that subverts and circumvents every honest attempt at regulation. And we call, above all, for the nationalization of the financial sector – and all sectors of production and distribution – to eliminate source of capitalist power over the popular will. More generally, socialists warn that capitalism “permits” and or “allows” democracy only to the extent that it does not endanger the class privileges of the bourgeoisie. That, and not because we are hidebound dogmatists, is why we will not and should not give up the ghost and accept welfare-state capitalism. ‹ Weinsteins in the Workplace: Will Unions Be Part of the Solution Or the Problem? I appreciate the thoughtful responses above. What troubles me is that if “socialism” has failed whereever it was tried, because in our minds, it was not “real” socialism, what makes you believe, after so many failures, that we can ever achieve the real thing? People in Eastern Europe and China, for example, are likely better off and happier under capitalism. Why should they want to take another leap into the dark? …why are there rising fascist movements there, particularly in Poland and Hungary? If they are so unhappy, why are they completely uninterested in a socialist alternative? We (American democratic socialists) don’t live in overwhelmingly peasant countries. We (US socialists and workers in general) live in wealthy countries and have access to very sophisticated technology. We don’t hold to utopian “socialism in one country” doctrine. We’re internationalists. We take civil rights and liberties seriously. And as Barry made plain, capitalism is an innately crisis-prone and ecologically destructive system which is incapable of meeting the needs of the vast majority of the world’s people. No social-democratic reform we win can “fix” this. Socialism: There Is No Alternative. Look around and see where socialism has caught on. In the US, never. In Europe. socialist movements are in retreat. Everywhere the class struggle is overwhelmed by national. religious and ethnic struggles. Finally where non-capitalist governments have come to power, they have failed. Who in China, for example, yearns for the return of Maoism? Do Germans living in the east want a restoration of the DDR? Where would we rather iive? In capitalist S. Korea or non-capitalist N. Korea. How long do you wait for the Messiah? …some people in ex-East Germany are nostalgic for the DDR because they had more job security, welfare, etc. than they do currently. All of your other questions were answered by Mike and Barry. Putting it in terms of “waiting for the Messiah” is…well…silly. Nobody’s waiting for anything. We’re not so passive. And to say that the transition from capitalism to socialist democracy is a necessity, not merely a good idea or the best possible option, has nothing to do with Messianic anything. Also, Venezuela is clearly capitalist and always has been. It doesn’t matter what Chavez or Maduro have ever said. They never believed in working-class internationalism and their actions — supporting dictators everywhere from Belarus to Syria — bears this out. Some socialists. Also, Bennett, is the concept of “socialism in one country” unfamiliar? Tito, Mao, Ho, Fidel…they all believed (or said they did) they could build classless societies in single countries. Pure idealism — especially in predominantly peasant societies. Marx, Engels, Luxemburg, Lenin, Trotsky, Zetkin, Mehring, et al. all knew better. And all of those Stalinists were fundamentally nationalists before anything else. None even attempted to do what Lenin did — call for a new International, which is a prerequisite for making socialism possible. No international alliance of parties — no way to take power and hold it in today’s almost-fully-capitalist world. Socialism: There is No Alternative? Its 169 years since the Communist Manifesto. Has revolutionary socialism succeeded anywhere and does it have any realistic possiblity of succeeding any time soon? Capitalism has shown far more vitality than any Marxist predicted. What makes you think it is doomed?